I am right into that white space thing. 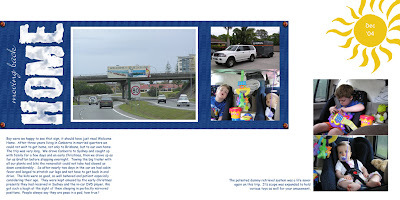 Have just done this layout tonight from our move home to Brisbane back in Dec 04. I love the piccie of the kids precision sleeping team LOL. I kept the stamped word home and also a clear inked yellow sun I did but decided I preferred Stephanie's sun brush (Obsidian Dawn), so if anyone wants them let me know. It is getting late, hubby is nearly ready to turn in, so I think I am done scrapping for tonight. LOVE the kids precision sleeping team!!! too cute!